Today I will give you an exercise you can do anywhere at any time. It will take care, or prevent the number one problem in the face, which are frowning lines between the eyes. 1) Wash hands and face. You have to massage with clean hands. 2) Make sure your face is damp. 3) Use a moisturizer to facilitate the movement of the fingers on the skin. 4) Apply the moisturizer between your eyes. 5) Run your hands outwardly from the center of your forehead, just above the top of the nose to the side of your head. Do this for about three minutes. This helps you relax the muscles in your forehead and in turn help you stop frowning. This is a perfect exercise you can do at work or even when you are watching a movie. It will have immediate results, your muscles between the eyes never felt so good! 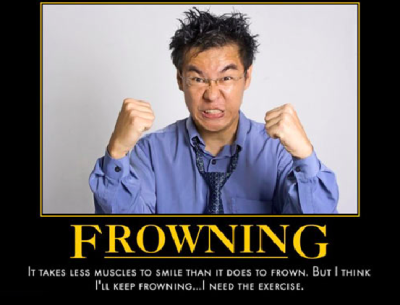 Do this exercise two or three times a day and you will see it can help you to stop frowning in a short period of time.